White Island is New Zealand's most active volcano. It is here that the evil Dagda Mor broke through the magic barrier of the Forbidding. Whenever I stand at a film location, reality turns into fantasy. You play the relevant scenes in your head and imagine the characters popping up right in front of you. Not so on White Island. This place is different. Very different. 1. It's hard to reach. From the outset, it's no easy feat to get out to the island which lies about 50 kilometres off the coast. Either, you brave the often rough seas on a boat, or else climb onboard a helicopter. I opted for the latter and hopped on a tour with Frontier Helicopters. 2. It's an active volcano. It's a weird feeling, stepping onto a tiny active volcano in the middle of the ocean knowing that the island's alert level rating is constantly somewhere between 1 and 2 on a scale of 0 to 5. Before the start of the guided walking tour through the crater, we had to don gas masks for the sulphur clouds that can waft your way any time. 4. Its crater lake is of a very fickle nature. The main geothermal feature on the island is the crater lake. The water is extremely acidic, sitting at a pH of 1, and its average temperature is 50 degrees celsius. The lake level varies constantly and is closely monitored by vulcanologists, as it can rise quickly. Approaching the edge of the crater lake. During our visit, the water level was extremely low. 5. It's a place of human tragedy. 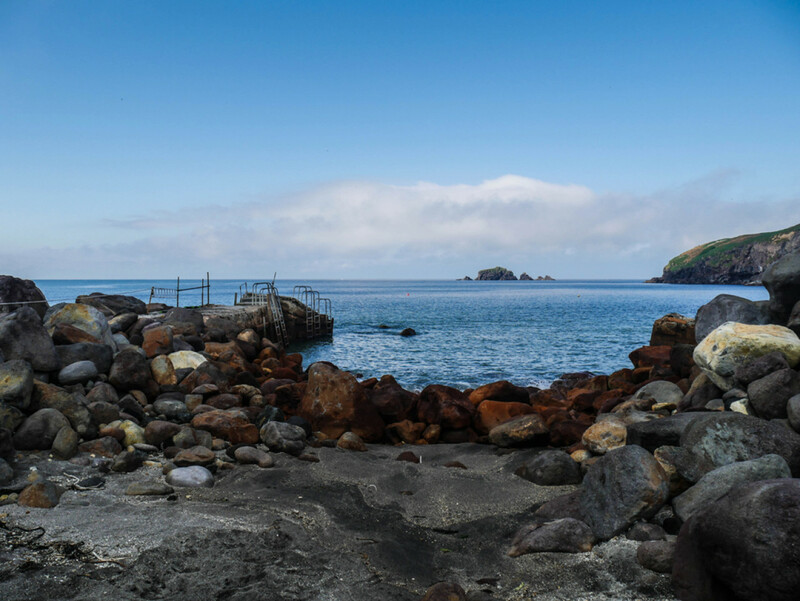 In the early 20th century, the island's sulphur was mined and then shipped to the mainland. The old wharf for the boats can still be seen today. Mining came to a brutal halt in September 1914 when a lahar killed all of the ten workers who were stationed on White Island. Some parts of the sulphur factory have managed to survive the harsh environment. 6. The spirit of the evil Dagda Mor is still lingering. It is easy to see why the makers of the Shannara Chronicles chose this location as the place where the evil Dagda Mor breaks through the curtain of the Forbidding into the world of men. While I was on the island, I constantly felt like some kind of dangerous entity was observing me from the depths of the volcano. Seriously guys, this place is spooky. Because this otherworldly place is a unique environment - unlike any other film location I have ever seen before. Being on the island also gives you an acute sense of the raw power of nature - and how thin the layer between us and the Void actually is. I ventured out to the island with Frontier Helicopters the only licensed helicopter company that services White Island. These guys have a lot of experience - also in the area of aerial filming. White Island can also be visited by boat. A good resource for initial research are the websites of Bay of Plenty Tourism and the city of Whakatane.